Well, don’t we have a special little number here! With nine colours for the exterior, a choice of three roof colours, two mag wheels options that consist of a choice of two alloy rims – one silver and the other black – the answer is a stylish small FWD SUV that’s takes all the attention away from similar offerings in the form of the Mazda CX-3 and Toyota C-HR. I do like the subtle black gloss alloys set against the white exterior panelling and red roof – really cool! Enter inside, and we have another pick-and-choose selection of steering wheel-and-dash trim and colour offerings. One thing is for sure, with Citroen you will be making a fashion statement – something Citroen has been doing for decades. 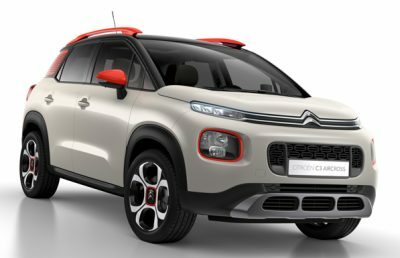 Seriously, Citroen C3 Aircross buyers can make a choice between 90 colour coordinations for interior and exterior mixing. Good job Citroen! With a higher ride height, you’re going to enjoy a pleasant riding position that boasts a dash design with C3 Hatchback familiarity and snazziness. This is a Citroen, so if you want the small car with the best ride comfort, then this is the one for you! The Citroen C3 Aircross comes with Citroens talented suspension (classic Citroën settings for all driving conditions) which soaks up harsh road undulations with ease, while also making life comfortable for occupants via the cushy, wide seats that are upholstered in a plush modern fabric. They might look like a lazy-boy chair, but in reality they are a lazy-boy chair – if you get what I mean! The really nice cushy feel is excellent for the long haul – if somewhat lacking in sideways support – but that’s ok because this isn’t the racy DS3 model we’re talking about here. And because it’s not the sporty DS3, the C3 Aircross won’t handle like a DS3 either. So the Aircross rolls gently around the corners soaking up the worst roads ever. A cool feature sure to be loved by all is the panoramic sunroof which electronically opens and closes at the touch of a button. On this note, even with the panoramic sunroof closed, the Citroen C3 Aircross boasts an airy, light cabin with loads of vitamin D shining in for a great healthy environment that’s roomier than you might think – given the car’s small outside dimensions. 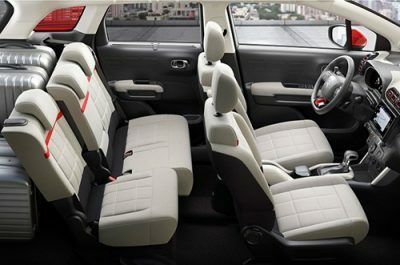 Citroen designers cleverly provide seating for five and plenty of luggage space behind the rear seats. Thanks to the taller roof, taller adults will be pleasantly surprised at how well they can slip inside the C3 Aircross cabin space. The split-folding rear seats can be slid forward to provide 525 litres of luggage space – a really handy and practical feature. It doesn’t stop there, however, because the front passenger seat can fold down flat so as you can take some objects into the car’s cabin that are up to 2.4 metres long – really handy! Three petrol and two diesel engines power the C3 Aircross in the UK, however in Australia we are going to have just the one engine variant (sadly) at the moment – the 1.2-litre, 3-cylinder turbo, petrol engine that is linked to a nice six-speed automatic gearbox. In this guise we get 81 kW and 205 Nm to play with – which is quite modest but feels fine for his sort of car. Actually, it’s a lively unit that gets along quite nicely thank you very much! Fuel economy is a winner at an average of 5.6 litres/100 km for everyday driving. This new small SUV features Citroen’s graphic signature two-tiered headlight design that looks awesome – especially at dusk. At the rear, the new C3 Aircross underlines its height with a strong window ledge that’s sits high producing a characterful on-road presence. The Aircross wheel arches are pronounced with extended wings and self-coloured lower sill panels for protection from minor impacts. These extensions add to the car’s strong artistic design. 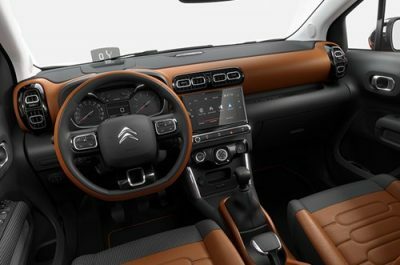 Some pretty cool features you’ll find on-board your new Citroen C3 Aircross is the wireless smartphone charge pad, a 7.0-inch touchscreen that controls climate control, audio, navigation, and vehicle settings, Apple CarPlay and Android Auto, smartphone connection, and a colour Head-up display which even remains visible through polarised glasses! When the going gets tough, the 2018 Citroen C3 Aircross comes with a FWD Grip Control feature to raise its light off-road abilities to a moderately higher level. The clever Grip Control system gives you much more traction to get through mud and over other slippery road or non-road surfaces. By using the stability control system, Grip Control allows either more wheel slip for progress in sandy conditions, or tighter control to allow controlled take-offs on ice. Settings for mud and gravel are also standard, while Downhill Assist Control is also part of the new C3 Aircross package. Safety features include a strong safety cage, DRLs, Blind Spot monitoring, Park Assist and Heads-Up Display. So if you want the comfy, cool small SUV that’s got loads of cool features, the C3 Aircross might be your small SUV match made in heaven. 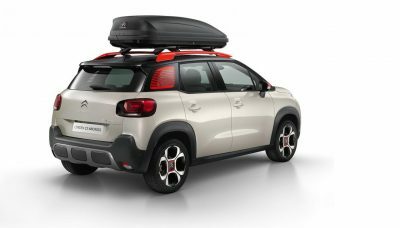 For any more information on the new Citroen C3 Aircross or, for that matter, any other new car, contact one of our friendly consultants on 1300 303 181. If you’d like some fleet discount pricing (yes even for private buyers! ), we can submit vehicle quote requests out to our national network of Citroen dealers and come back with pricing within 24 hours. Private Fleet – car buying made easy!